Standing back and wiping his brow, the shadow Ruki gave his new creation a scrutinised once-over. The open-topped crate held a cushion for a seat and a steering wheel that connected to two pairs of old pram wheels and their respective axles. It was painted yellow and purple, with the words "The Flying Feepit" stencilled along the side in white and also had a platform nailed to the back of it. The excited voice caused the Ruki to turn his head just in time to see his best friend run up the garden path to his shed. Rupert was an athletic Kacheek with a cheerful personality, someone you never minded having around you, and Zeke had called him over specifically for this occasion. "Hey, Rupe!" high-fiving his buddy, Zeke nodded his head towards the cart. "So, what do you think of her?" "What do I think?" Rupert replied with a teasing hesitance and a sparkle in his eye. "I think you need to get out more, my friend…and why is it a she all the time? Why not a him, or and it or they? Why? In fact, why ask why?" "I guess that means you like it, huh?" "Yep," the Kacheek nodded, pacing slowly around the cart, looking it from every angle in a mockery of a professional. He whistled through his teeth, a habit Zeke had come to know and love. "Well, it's a beauty all right…is this what you're entering into the Neopian 3000? Oh, wait, what am I saying…? Of course it is! You're not exactly one to build a go-cart because the mood takes you, and it's great…but just two things." "Shoot," Zeke smiled, shrugging his shoulders nonchalantly. "Firstly, what in blazes made you call it 'The Flying Feepit'? I mean, it looks nothing like one of those guys, and with out wings the closest thing you'll get to flying in this thing is if you drove it off the cliff on Terror Mountain and even then it will be for about…oh, I don't know, two, maybe even three seconds?" Crouching down beside the cart, Rupert slid his paws up and down the polished exterior. "Besides, it looks more like a Lemon Grape Smoothie on wheels." "Yeah, well I was going to call it 'The Mobile Lemon Grape Smoothie', but I want out of stencil space in the planning," Zeke drawled sarcastically, punching Rupe playfully on the shoulder. "Come on, give me a break…yellow and purple are the only colors my owner bought, him being the artistic Tyrannian that he is. Hey," the shadow Ruki stopped himself in mid-rant, "you mentioned that there were two problems. What's the second?" "The second problem, my dear fellow," Rupert answered in cheesy posh accent. "Is that this vehicle of yours just isn't road worthy. I mean, it has no brakes!" "Oh," Zeke murmured with a hesitant nod, walking around to the opposite end of the cart. "Well, you see, this cart doesn't need brakes." "Really?" rising slowly, the Kacheek stood across from his friend, hands on hips, feeling he knew what was coming. "Why not, may I ask?" "Well, if we do need to brake," Zeke began, cringing sheepishly as Rupert mouthed the word 'We?' "All you need to do is jump off the platform and pull the cart to a stop…oh, come on, Rupe! I need you; you're the best runner in our year! Please say you will, Rupe, please? Please?" Rupert just stood there, gazing at his Ruki buddy with raised eyebrow. "Wow," he muttered finally, shaking his head and walking around to meet Zeke at the other end of the cart. "That was…that was…what was it? Was it emotional, breathtaking, and maybe even captivating? Well, it was none of those things, so what could it have been? Oh, yeah…pathetic. Come one, Zeke, why do you really want me to push your contraption around the track?" "Because you're the only one I trust with my life?" the Ruki asked cautiously. "That's my boy," Rupert chuckled with a warm smile. "Also very pathetic, but at least it's the truth…okay, so when's the race?" "Y-you mean you'll race with me?" Zeke stammered in disbelief. "No, I just want to be there to see you sitting stock-still at the starting line without a runner," Rupe retorted sarcastically. "Of course I'll race…let's go for gold!" Finally the day of the race arrived, and the makeshift track was built on the sports green just south of Neopia Central. The stalls were packed within minutes with millions of excited, hyperactive racing fans ready to see the best Neopian 3000 to date, and from the line-up in the Pits, they wouldn't be disappointed. Other than Zeke and Rupert's 'Flying Feepit,' there were seven other carts entered, many of them looking worse then theirs. 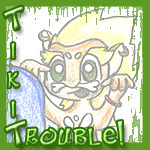 But there was one, a certain 'Striped Speedster' that both the Ruki and Kacheek were seriously worried about. Its driver, a sour-faced Nimmo called Hal, was the Neopian 3000 winner six-times running, and his vehicle was the fastest thing on four wheels and two legs, which belong to his equally nasty partner, a mysterious silent Grarrl known only as Zip. Right now the evil pair were walking slowly down the line of competition, spreading nasty comments and general discouragement amongst the ranks of racers. "You call that a go-cart?" Hal sneered whilst Zip laughed silently, cracking his knuckles. When Zip cracked his knuckles, he didn't need to say anything. "I don't even need to say 'you're going to lose,' because it's obvious just by looking at the excuse for a racer you're going to try and drive." Zip nudged his crony and pointed a sharp claw towards Zeke and Rupert and their go-cart, Hal sneered even more. "Well, well, well, what do we have here?" he murmured, voice dripping with concealed venom. "What do you call that…'The Flying Feepit?' What an absurd and false name to call something as hideous as that. Why, it looks more like a -"
"-a Lemon Grape Smoothie on wheels, yes I know," Zeke muttered darkly, avoiding the two competitors gaze as he put some last minute work into his cart. "Why don't you stop wasting time looking at everyone else's carts and pay closer attention to your own, before it's consigned to the scrap heap where it belongs, huh?" "Can't," Hal retorted sharply with a superior tone. "You see, I've been given a task to do…er, what are your names again?" "Zeke and Rupert," Rupert answered evenly, rising up and staring Hal straight in the eye. Rupert wasn't one who was easily intimidated, and he hated anyone who tried to bully him or his friends. "Why? What's it to you? Want to know the names you'll be muttering in despair when we steal your winning streak from you?" "How quaint," Hal murmured with mock amusement, "the Kacheek has a fiery temper…well, it's lucky I bumped into you, because the judges wish to see the newcomers - to remind them off the rules." Zeke cast an uncertain sideways glance at his best friend, who nodded grimly. "Don't worry, I'll wait here," Rupert told him seriously, "then when you get back, I'll go and see the judges…just in case." "No time for two trips," Hal told them with wicked pleasure. "You have to go together, I'm afraid." "I bet you are," Zeke muttered as he pushed past the smug Nimmo. "I just bet you are…"
Half an hour later and the racers were in their positions at the starting line, Hal the former champ taking the outside and furthest track whilst Zeke choose to be close to the middle, just to be fair. As he looked his cart over as best he could given his awkward position and limited time, Zeke was relieved to see that everything seemed okay with the Flying Feepit. Craning his head around, he called up to his partner above the excited roar of the audience. "Everything look okay to you, Rupe?" "As okay as it will ever be, buddy!" There it was, the flag was down and the race had begun! Zeke didn't need to tell his Kacheek runner to 'step on it,' his athletic friend was already pushing off at an amazing speed, slamming Zeke back into his makeshift driving seat as he prepare to take the first corner, a basic 45 degree turn. The Ruki took it perfectly, pulling into the lead with only a slight juddering as the old wheels grinded against the firm gravel path…a juddering that got louder and stronger as the pair and their cart got nearer to the second bend, an S-turn that swayed between four trees. Then the juddering stopped and the front wheels fell off, having slowly shook and slid off their axles. Zeke only had a split-second to curse his decision to leave Hal alone with his cart before the nose of the Flying Feepit slammed into the track, grinding uncontrollably and at high-speed straight ahead…right into the path of the fourth and final tree. As the cart hit the trackside barrier at nearly twelve miles per hour (which was pretty fast when you couldn't control the vehicle and couldn't get out), it buckled on impact, throwing both its driver and pusher free of the crash and towards the tree. As he seemed to fly through the air in slow motion, Zeke was surprised to find he was glad that he'd decided to wear a helmet after all. Then he hit the massive trunk of the tree headfirst and everything went black. When he woke up a few moments later to a cacophony of worried and concerned murmurs and shouts, he fumbled clumsily to get his goggles up over his head. There were at least a dozen people crouched around him, some trying to remove his helmet whilst other hastened to stop them. "What…what happened?" he asked groggily, momentary amnesia clouding his memory of the recent events. "Did we…did we win?" "If this is winning," Rupert called down from the branch he'd been thrown on to. "Then they can keep the trophy…I just want to go home and never look at another cart again." Out of all the faces crowded around him, Zeke managed to make out one particular face. It was the Eyrie flagman, and he seemed to be a mix of concern and anger, though somehow Zeke could tell the latter wasn't aimed at him. "The race is over," he told the poor Ruki with an apologetic tone. "You didn't complete the race and therefore Hal and Zip won their seventh consecutive Neopian 3000." Zeke groaned with despair; after all his hard work, all his ambition was put out by a cheater. He would never compete in the Neopian 3000 again, he was sure of that…Hal had won again, and he'd have no more competition from Zeke. "However," the flagman continued, his hand extending beyond Zeke's field of vision and pulling someone over. It was Hal, and he looked as every bit defeated as Zeke felt. "We at the Neopian 3000 have a very strict rule concerning cheating, and since young Hal here was seen tampering with your cart, he is hereby not only disqualified from this race, but banned from competing…ever again!" So saying the Eyrie relieved Hal of his ill-earned trophy and shooed the disgraced Nimmo away. "Now, I know you didn't win the race," the flagman continued with a warm smile. "But all the other racers, along with my self and the rest of the judges, feel you deserve this more then anyone else. Congratulations Zeke." As everyone cheered in unison, Zeke looked up into the tree at his friend Rupert, and Rupert looked down from the tree back. "I told you we needed brakes," he winked. "I hear you, buddy," Zeke answered as he struggled to sit up as the cheering grew louder. "I hear you…"
Now, which way is the exit?